De la Reyweg is a 1+1 main distributor road along the western edge of the Transvaal/Schilderswijk neighboorhood in Den Haag. The road supports heavy volumes of thru traffic, but is also home to a large number of residences and some small businesses. Thus, pedestrian and cycle traffic is also common along this road. 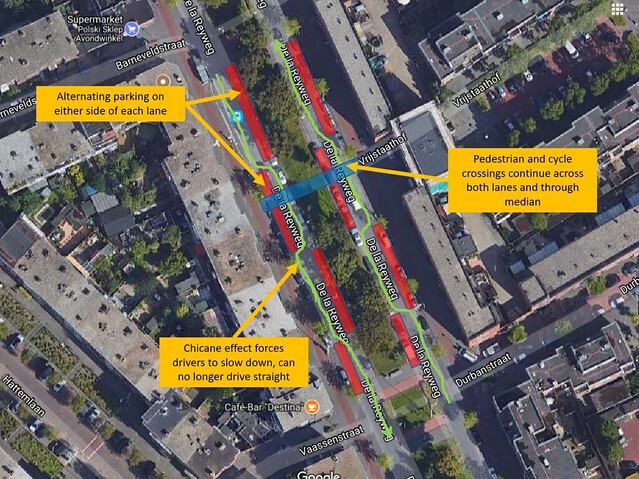 Unfortunately, the current infrastructure is not pedestrian or bike friendly (relative to other areas of Den Haag), and road space is poorly allocated in some stretches. Traffic calming measures are not designed on this straight road of smooth asphalt, encouraging speeding and presenting a hazard for cyclists and pedestrians at minor crossings. Overall, the street is not very pleasant to ride or walk along, and the lower income residents living in the area would benefit greatly from a road redesign. As shown in Figure 1, space is poorly allocated on De la Reyweg. Currently, each direction of traffic features a 12 foot travel lane with 7 foot parking lanes on each side, 8 foot one-way cycle tracks, 10 foot sidewalks, and a very wide 26 foot green center median. In order to change the purpose of De la Reyweg from a collector road serving thru traffic to a slower residential street, it is critical to improve the crossability for citizens in the neighborhood from ages 8 to 80. 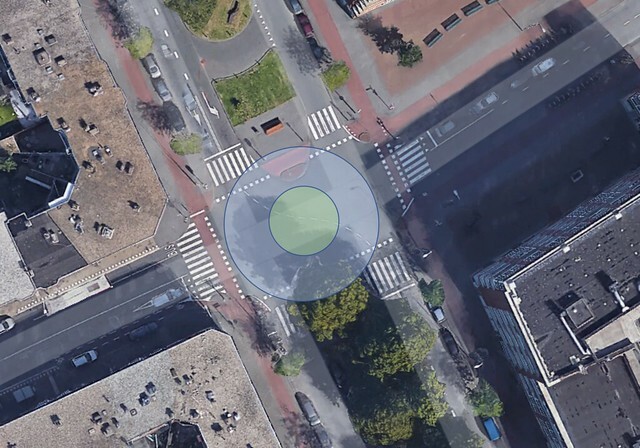 Currently, pedestrian crossings on De la Reyweg are infrequent with distances as far as 96 meters (317 ft) between the poorly marked crossings, as shown in Figure 2. An unfortunate effect of insulating a single lane of traffic with rows of parked cars on each side is that this allows thru traffic to travel quickly without awareness of their speed and how this affects the friendliness of the street. 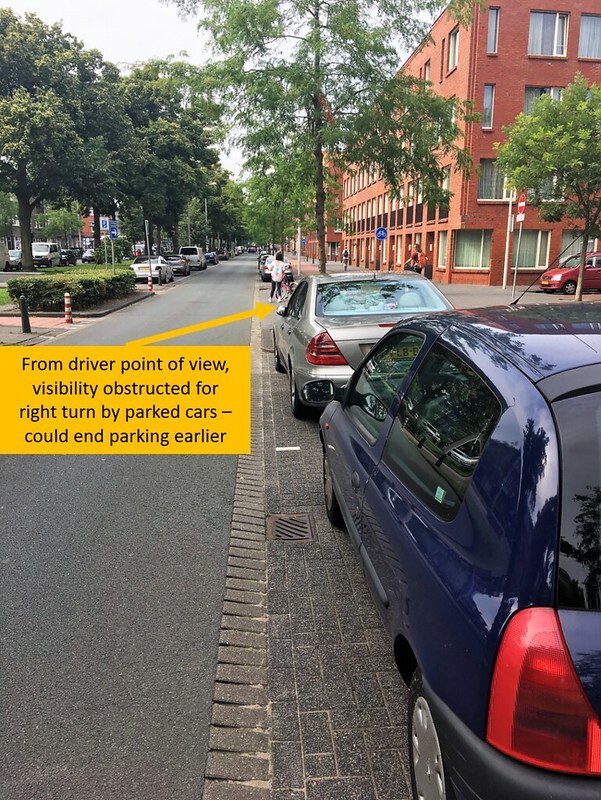 Additionally, where pedestrian crossings do exist, the two rows of parking extending right up to the crossing limit the driver’s visibility of pedestrians stepping into the road or cyclists rolling across, as shown in Figure 3. We believe that along with decreasing thru traffic and parking spaces along this section of De la Reyweg, public transit access should increase to encourage to fill this gap in car ridership. We would like to see more bus routes pass along this road that can bring pedestrians to the area, and potentially more bus stops in the neighborhood to help people get around. However, rather than building full bus bays that allow cars to pass a stopping bus, we would rather have buses make their stops in the lane to further control the speed at which cars can travel through the area (see Figure 4). The current look and feel of the sidewalks and cycle tracks along De la Reyweg is not conducive for creating a vibrant neighborhood. There are many residences and shops along the street, but one-way cycle tracks and narrow sidewalks are not the best option for generating foot-traffic for local restaurants and shops. Figure 6: Shopkeepers and pedestrians outside of a corner market. 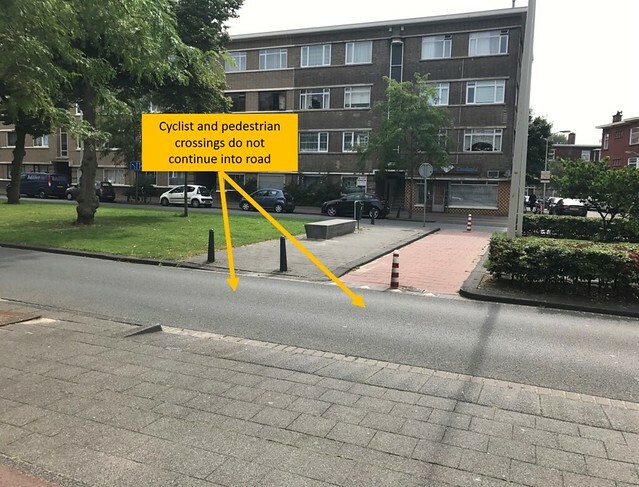 There are important speed control and safety measures missing from the current pedestrian crossings, and it is clear that this road does not meet the Dutch principles of Systematic Safety. 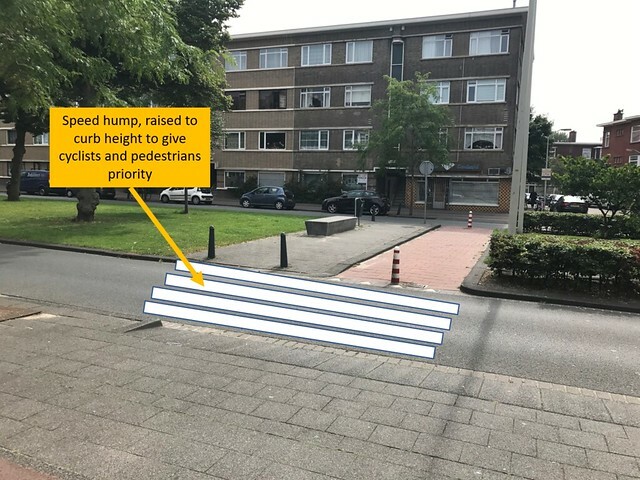 Our proposed redesign adds a speed hump up to a raised pedestrian and cycle track crossing at curb height, and marks these crossings with zebra stripes and red stamped asphalt accordingly. This serves as a reminder to drivers that the crossings are space belonging to pedestrians and cyclists, and will provide a measure to slow cars slightly. Including the speed hump design with more frequent crossings will help to enforce this speed control along the entire stretch of street, as well as improve access to both sides of the street from block to block (Figure 8). Our redesign of De La Reyweg eliminates an entire lane of parking on each side of the street, and has intermittent sections of street parking for each direction on the street that end well before a pedestrian crossing, improving the driver’s visibility of pedestrians, and vice versa. As an additional benefit, the alternating street parking creates a chicane effect for vehicles, serving as a traffic calming device that prevents drivers from speeding straight ahead, as shown in Figure 9. Figure 9: Redesign of on street parking alternates between both sides of travel lane, creating chicane effect for thru traffic. 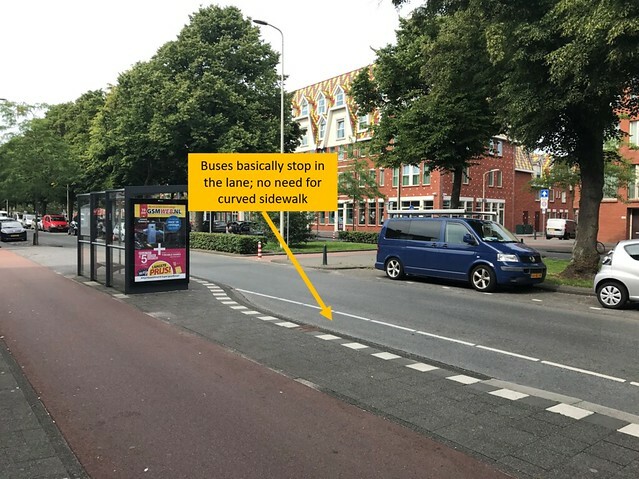 The bus stops do not require much redesign, but we do want to make sure that there is enough space for loading and unloading between the 2 way cycle tracks and the travel lane. The areas around bus stops can be further improved with the addition of trees and planter boxes, as well as more public benches for pedestrians to use. In order to make De La Reyweg friendlier to the neighborhood with more foot traffic, we want to make room for a 2-way cycle track on each side of the street. Alongside with this improvement, we would like to expand the sidewalk space between the cycle track, in order to make this space more useable to the public. By making it easier for cyclists to ride on both sides of the street and increasing the space for walking around storefronts, we believe that small business can flourish in this neighborhood and help to liven things up. Our redesign of De La Reyweg includes providing more sidewalk space, with the intention that small businesses can liven up the street with outdoor seating for patrons, displays of products, and shared space for people to meet and converse. Further additions to the street can include more public benches, play space for children, and a row of trees and plantings between the cycle track and the sidewalk. While a small amount of this neighborhood fabric already exists, we want to strengthen it by making the street more obviously a public amenity for all to enjoy and make use of. 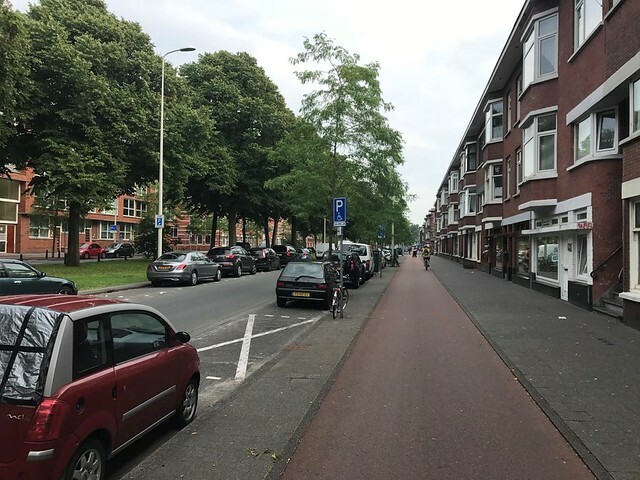 By encouraging shopping and making space for foot traffic, as well as providing two way cycle tracks for easier access to both sides of the street, we believe that De La Reyweg can become a lively neighborhood. A major goal in our redesign of De la Reyweg street is to encourage more use of this shared space among members of the community and to turn this into a true asset for the neighborhood. Currently, the design of the middle area between the travel lanes on each side of the street is not accommodating to walkers or playing children, and it is clearly underutilized (Figure 10). By slowing down traffic in this area and making the street more crossable across the board, as well as adding more frequent raised pedestrian crossings (Figure 11), we believe that this space can be more inviting to citizens of the neighborhood. We would like to see a walking path and some benches added to this green space, and perhaps even some community garden lots can start to be developed. Our hope is that this largely unused area can become a place for children to play safely, and for adults to enjoy without the noise and commotion of thru traffic on the street. Figure 10: Green space between travel lanes with infrequent pedestrian crossings and few public amenities. 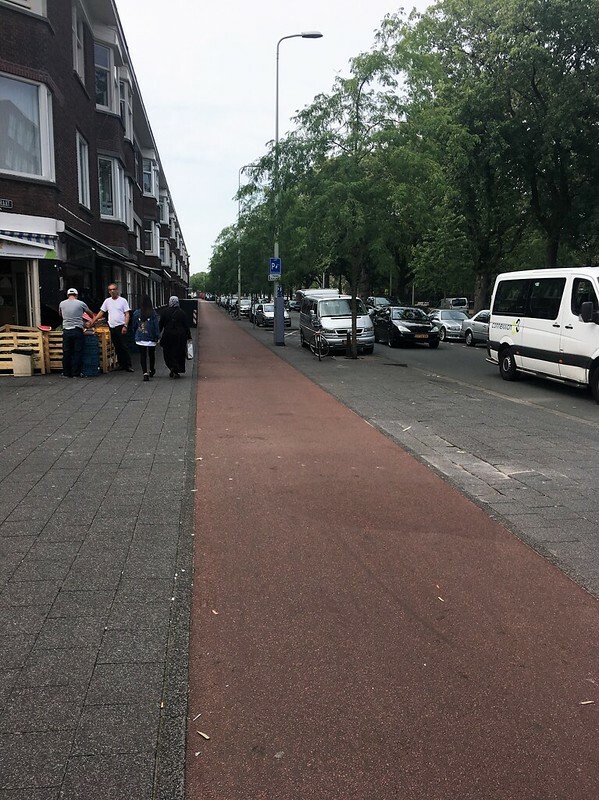 While on site, we observed that the intersection of De la Reyweg with Terletstraat caused a significant amount of vehicle backup with long signal intervals and just the single travel lane on each side of the street. With the repurposed De la Reyweg becoming a slower residential street that thru traffic is discouraged from travelling on, we believe that a more efficient and safer intersection would have a roundabout rather than a signalized intersection (Figure 12). There is plenty of space to design a roundabout with cycle tracks on the outside, given the approximate 50 meters (160 ft) diagonally that can be used. Adding a roundabout would provide another self enforcing feature on this street redesign to keep the speed of vehicles at or below the desired 30 km/h. Giving cyclists priority when moving around the roundabout would further reinforce the intent of this street to be crossable, friendly, and amenable to the citizens of the neighborhood. To increase the share of bike ridership in the neighborhood, it is critical to provide sufficient bicycle parking facilities to both ensure the protection of property and to keep the street orderly. 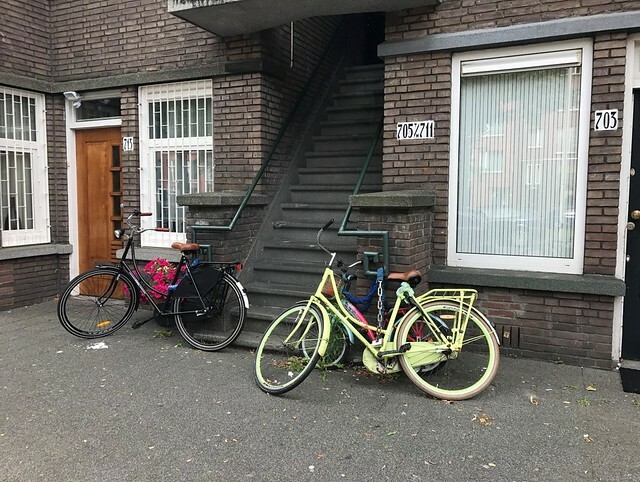 We observed multiple demonstrations of not enough bike parking along this stretch of the road, with bicycles being locked to stairwell railings, sign posts, and small trees (Figure 13 & 14). Although it is a simple measure, adding more bike parking facilities sends a clear message to the community that bicycles are welcome. 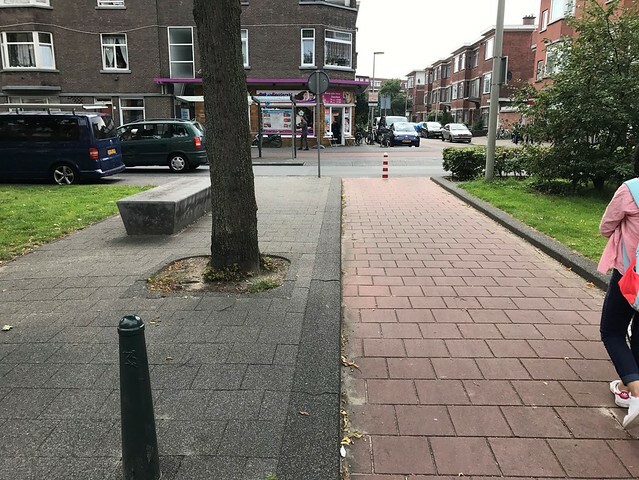 Furthermore, as the sidewalks of this street see an increase in foot traffic, it is critical to keep a sense of order with the placement of bike parking between the 2 way cycle tracks and travel lanes. 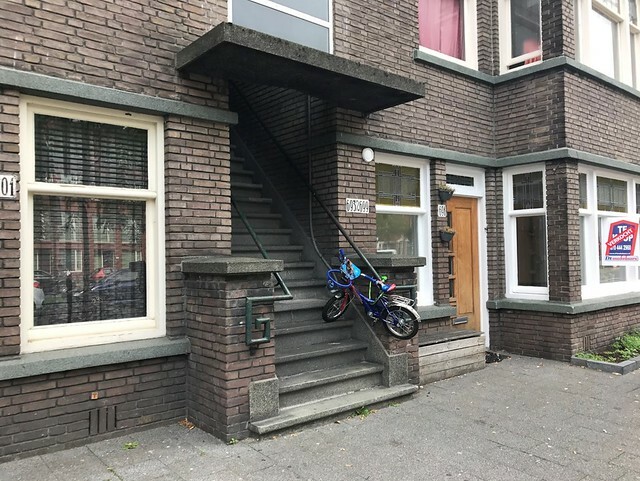 Haphazard or informal bicycle parking doesn’t look very appealing, and can discourage the use of sidewalks as a public space. 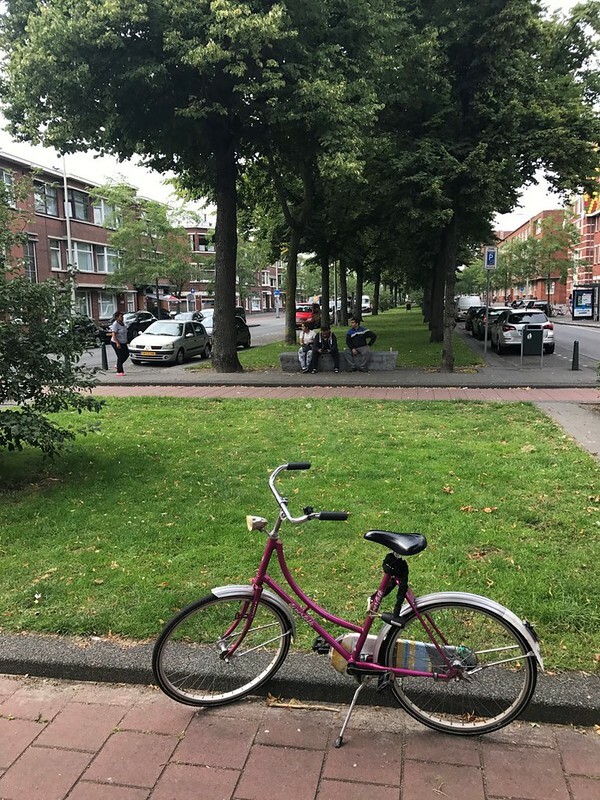 By improving infrastructure for pedestrians, cyclists, and cars in the the Transvaal/ Schilderswijk-west area inhabitants have better access to the center of The Hague, where most jobs and shopping takes place. By encouraging cars to use the center ring road, motor traffic on distributor and local roads can be reduced. The combination of reducing through traffic while improving sidewalks, bicycle infrastructure, and public spaces will lead to more enjoyable streets and neighborhoods. Improving both public transit and the bicycle network in this area will encourage use of more sustainable forms of transportation for daily travel. By decreasing the reliance on the car, the streets will become less polluted and friendlier on a human-scale.